Beloved in Biergartens, festivals, and in German homes, dishes made with the combination of spaetzle and sauerkraut tend to be comforting, harmonious — and just plain tasty. Krautspaetzle can be seasoned with juniper berries (or caraway, according to local tradition) and flavored with onions, bacon or speck. Variations add Emmentaler cheese and top with grilled Bratwurst or even pork ribs. Explore our selection of sauerkraut spaetzle dishes, and welcome the flavors of fall! 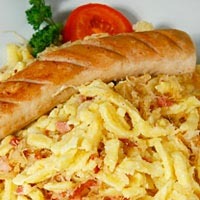 This wonderful Krautspaetzle is served at German fairs and homes, and is a traditional dish from Schwabia. A layered casserole of spaetzle, sauerkraut and cheese that’s the ultimate comfort food.